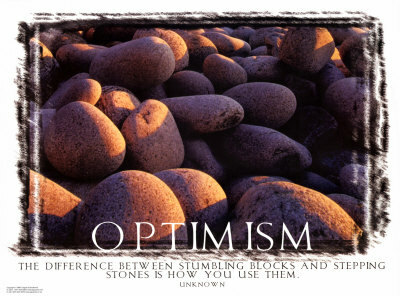 My thoughts today are regarding Stumbling Blocks and Stepping Stones that are placed in your life. There are many things we face that prevent us from moving forward but we should never forget that for each Stumbling block you encounter there is a Stepping Stone that keeps your balance. Everyone stumbles at one point in their life with things that life throws at them and typically they occur through the actions of others and sometimes they are circumstances that are beyond our control. We may trip and fall on many occasions, but remember that you all can get back up again. You get up when you percieve that what you tripped over was just a temporary road block to you pursuing your dreams, your destiny, and your call in life. Whether you chose to stay on the ground is all dependent on how you view the blocks in front of you. It either halts your journey temporarily or prevents you from moving forward altogether period. It’s all in how you view what is right in front of you. I believe that each person is given a measure of grace to handle a measure of problems better than another. Having said that, the over-comers that are able to endure such portions should not be the first to laugh at their brother or sister that cannot handle the same measure of trouble and pressures that life brings to hinder them from reaching their full potential. You must remember that if each one of us is a block; we all need each other in order to build something great that will benefit not just ourselves but each other. The analogy that comes to mind is the whole idea of the architect. An architect needs a plan in order to build a fine structure. An architect knows the number of materials required to build that structure and that also means that each brick and each building material is accounted for. They also know that one brick is enough to compromise the integrity of the building and they also know that if you leave one stone unturned, the building structure will most likely collapse. That is why each block is just as important as the other. Each block has a destiny to build this fine structure. The thing is, you must realize that not every block is set in the same place because each block is positioned differently to create the building. This means that each block has a unique purpose and a unique position in life. No brick is the same and yet together as one, they build something beautiful. The structure is your destiny, so in essence I am saying that you need people in your lives to reach your destiny. You cannot reach your goals in isolation. You need people and the types you need are those that are there to help you build the Character that you require to fulfill your destiny. Why am I using this analogy? What has a building got to do with me the individual? 2. A Stepping Stone to your success in fulfilling your dreams and your destiny. Sometimes we have no idea what we will become in life, but when we connect with strong individuals along the way that are purpose-driven and have some sense of direction, they are the stepping stones that we need to realize our full potential and provide us the direction to recognize our purpose in life. Some people hold fast to their dreams and some just have no clue where they are going, but in essence, we must value each connection that we make because we need each other in order to fulfill our destinies. We all have the ability to build each other and break each other. When you encounter people in life that are stumbling blocks, they are the blocks that you have to learn to jump over and kick to the curb in order to keep moving forward. If you stand there looking at them, then you allow them the power to halt the progression in your life; you have stopped building yourself. There are other blocks around you that are waiting to be part of your life so that you can continue towards your destiny. They are the connections that you need and they are your Stepping Stones. Stepping stones are the kinds that pave the way to fulfill your dreams and direct you to your purpose. They are the bridges that take you to the other side and are the types of people that building strong characters. Stones are always rough around the edges but as you press onwards towards the goal forgetting that which is behind you (Philippians 3:13-14), you will become polished, refined, and strengthened by the hard knocks in life. They are the positive reinforcements that nurture you to stand firm until you are no longer shaken by the things that cause you to stumble in the first place. When you reach your goals, do not forget your brother and sister that are behind you still jumping through the same hurdles as you encountered on your journey. Please understand this principle and remember that you must also become a stepping stone to their future destinies as well. This is a lesson that many fail to do when they finally reach their goals. Fulfilling your purpose is one thing, but you must understand that you have the ability to build others as well. 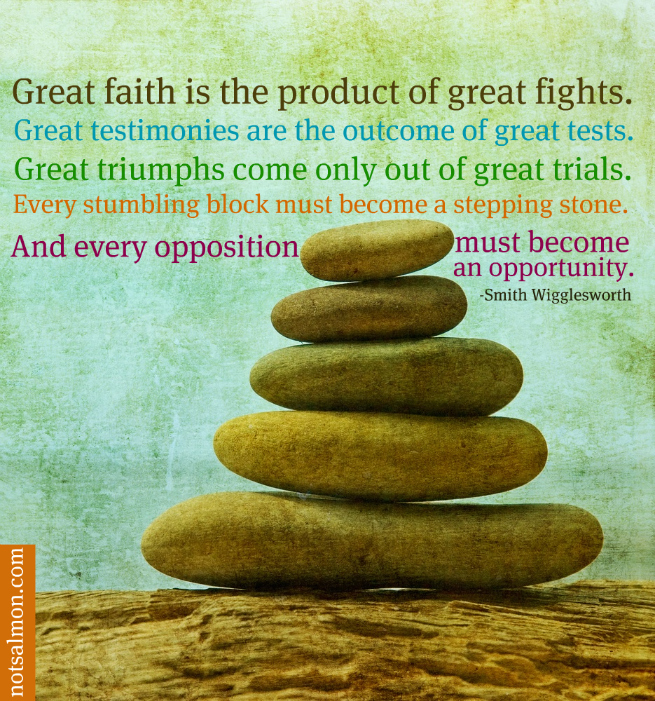 Stumbling blocks are blocks that fail to be part of the great plan in your life. They try to thwart your ideas and your dreams by dashing them with negativity and pain. Understand that stumbling blocks are necessary in your walk because they shape you along the way. You may trip all over them and think you’ve encountered a road block or failure but they are there to test the level of your perseverance. Don’t allow negative people and negative experiences keep you from pursuing purpose and fulfilling your dreams. 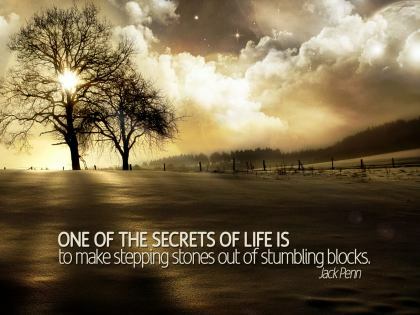 Remember, stumbling blocks do what they are called to do and that is make you stumble. It’s up to you to rise up again and continue your journey. Also, consider the way you view failure. Turn your failures into something that you can learn from and not into a reason as to why you cannot continue your destiny. My Last Note: If anything, you should learn to recognize your Stepping Stones from your Stumbling Blocks in your life. Respect your Stepping Stones because if you disrespect them, you become a Stumbling Block and terminate your destiny because of arrogance. Stumbling Blocks are loners and Stepping Stones work together to build something great. Ask yourself, what are you? Are you a Stepping Stone or a Stumbling Block? Understand that you cannot avoid Stumbling Blocks but you can always kick them to the curb when they cross your path. It’s all in how you look at yourself and others that you meet in your life. Value the lessons you learn from your failures and treasure the journey towards your success. When you reach your destiny, remember those that are behind you and become their Stepping Stone to success as well. This will not only enlarge their territory but it will also enlarge yours! Poet, this blog is like therapy for me too. Be encouraged and know that you are not alone my friend. I encourage myself through all this for even I am not at my best at the moment but it is during these times that I pour out my thoughts on this canvass trying to paint beauty from my pain. So I understand. Keep the positive vibe goin’ and never give up :). That is true Russell. We become what we think so we must guard how we think. I must say, this a very brilliant post! Excellent job. Beautifully outlines the importance and value of interdependence over independence. That’s something the world can really make good use of nowadays. Thanks Tarisai! May God reveal our Stepping stones to success. At this time it looks like WordPress is the top blogging platform avaiulable right now.